I think most folks know that Tonight Show host Johnny Carson had a successful clothing line at one point, but did you know he had a restaurant chain as well, called Here's Johnny's? 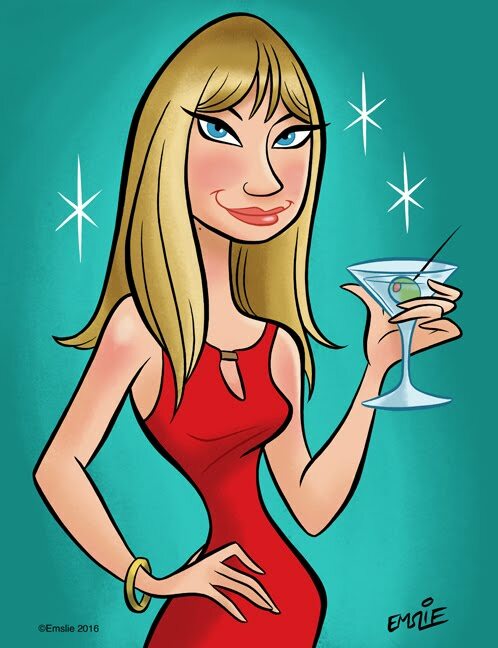 What about a Laugh-In restaurant based on the popular NBC comedy show? Well, you bet your sweet bippy these existed--albeit for only a couple of years. By the late 60s, Johnny Carson was one of the biggest names on television, and The Tonight Show was being seen by 8 million Americans every weeknight. So I guess that somewhat makes sense that Carson teamed up with the Swanson family of the frozen food line to launch a restaurant franchise called Here's Johnny's! 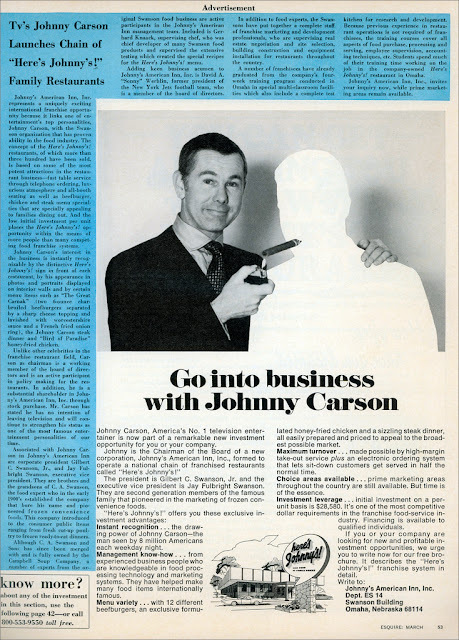 Carson served as Chairman of the Board for the company overseeing the chain, Johnny's American Inn, Inc. The restaurant offered 12 varieties of burgers, including one called "The Great Carnac" ("How big is it?" asked the menu) and a honey-fried chicken dinner called "Bird of Paradise." It was supposed to be an innovative chain that would deliver orders in half the time of the average fast food restaurant. According to the above advertisement that appeared in Esquire, more than 300 restaurant franchises were purchased...but I'm guessing that far less than that actually opened. The best information I could find was that by 1970 there were 8 restaurants operating, mostly in the Omaha, Nebraska area. A clue to why the chain closed may be in a court record I found online from 1974. An advertising agency sued Johnny's American Inn, Inc. for failure to pay over $78,000 in advertising fees. Who knows if they ever recovered the money. Too bad no commercials or ads for the restaurants themselves currently exist online. 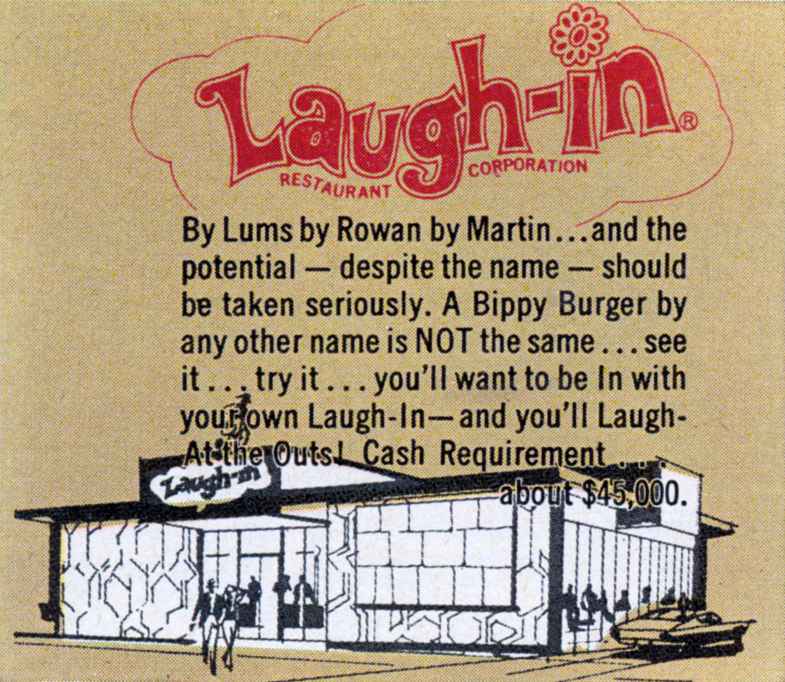 The Laugh-In restaurant chain sounds like it may have enjoyed slightly more success--someone even purchased a napkin and bag from eBay! I think it's interesting that the cash requirement for a Laugh-In franchise was more expensive than Carson's--one of these babies would set you back $45,000, while the Carson chain required around $28,000. The big question here is if these had a whacky theme (I'm imagining a customer saying, "Sock it to me!" when placing an order.) In keeping with the show's catchphrases, there was a "Bippy Burger" on the menu, "Fickle Finger of Fate" fries as well as an ice cream sundae called "Here Comes the Fudge." A commenter on another blog says they made the best onion rings of any fast food chain, and locations were primarily in Michigan and Florida. Like Here's Johnny's, they pretty much closed by the early 70s (right around the time the show itself went off the air) and barely made a blip on the pop culture history books. 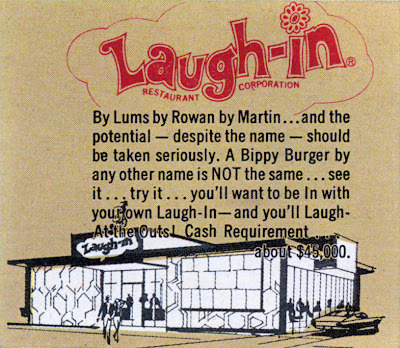 The Laugh-In restaurants were owned by Chivers, the same company that launched Lum's, which was a more successful fast food chain. Any of my readers ever eat at or remember Here's Johnny's or the Laugh-In restaurants? Doug -- Such a cool story; thanks for sharing that. Did she really call you "Sonny"? LOL. I bet she was perfect for the part of the stage mom in "Gypsy." I've never heard of these restaurants and it's weird they existed. Then again, I think it's weird Bubba Gump Shrimp Co. is a thing too. And it is always packed with tourists in New York. Wow! That's fascinating! I had no idea! It's too bad they didn't take off, it would've been fun to be at the Johnny's restaurant. The idea was just too far ahead of the times! Nope. Just goes to show you how fickle the restaurant biz can be if you don't have a keen business plan and some luck. I do remember Lum's, but not these restaurants! However, since you mentioned "Here Comes the Fudge", I remember Baskin-Robbins had a chocolate ice cream with fudge pieces in it called exactly that, in the late 60's. I was so sad when they took it off the board! It was a-mazing. I've been to a Laugh-in restaurant. It was in Warren,Mi.just outside of Detroit Ever hear of '8 mile'? It was on 12 mile. It tasted like McDs but they had pickel relish and the clown didn't so I thought they were great. The building is still there but it's now a bar and has been expanded over the years. Man I wished I saved a napkin. There was also one on east maple (15 mile) in troy...only open a year, the bippy burgers were great! I don't remember Johnny's restaurant or the Laugh In chain, but my first job was at Arthur Treacher's Fish and Chips! The food was good and it was a nice idea. Unfortunately, Arthur died not too long after the chain got started. It hung around for awhile, and today in Essex MD there is a "Fish & Chips" restaurant. The owner told me there are a few of these scattered around the country. I pass an old Arthur Treacher's on Orchard Lake road in Pontiac, Mich. The old time Lantern shaped sign is still on a post but the glass is gone. The building is abandoned. I remember my parents saying the prices were a bit on the high side (as I kid I could not care less) We usually ate at another burger establishment in Omaha that had a much broader menu with about 100 or so hamburgers with "funny names"
Probably the place you're referring to is Jack Holmes Ground Cow. To this day, best hamburger I've ever had, or maybe that's just how I remember it as a kid. It was on Pacific St. near 72nd. It's long gone. Not only have I ate many a meal at the South Bend, IN location of Here's Johnny's Restaurant but I worked there cooking. At one time I knew the recipe for "Bird of Paradise" fried chicken, the Great Carnac burger and the chili. Johnny's had a unique service style. Customers phoned from the booth their order to a switchboard in the kitchen. When the order was cooked, waitstaff would take order to the booth. Customers paid their bill at a cashier on the way out. No wonder this South Bend location went out of business. People would just walk out without paying. Probably a few Notre Dame students may remember Johnny's. I had heard the tales of Minnie Pearl's Fried Chicken and Bill Anderson's involvement with the Po' Folks restaurant chain, but had never heard of these two. Great read. Love the blog. 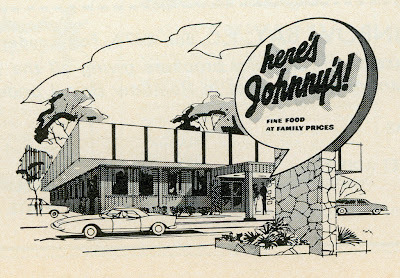 My Grandparents took me to a Here's Johnny restaurant on the west side of Milwaukee when I was a child. The biggest thing for me was ordering the meal from the red telephone that was located in each booth...a big novelty back then. I remember loving this place as a kid in Omaha! Yes I remember here's johnnys restaurant. I was a 19 year old and worked there in Metairie La. As a manager trainee. Customers would place the order over a microphone thst looked like an old time juke box. Curious the location in Florissant. There was a Here's Johnny restaurant in Lincoln where Ticos is now located. I have a matchbook from there. I started work in July 1970 as Night Head Cook in charge of the Kitchen at Here's Johnny on 28th street in Grand Rapids Michigan across from Berger Chevy. I met my wife to be who was the night hostess. Customers placed their orders by phones that were located in each booth. No other restaurant did this. I remember eating at Here's Johnny's in South Bend Indiana when I was a kid. There was a red phone at the table and I'm guessing that's how we ordered.